You'll be £4.99 closer to your next £10.00 credit when you purchase Tracing Your Servant Ancestors. What's this? Covering the period from the eighteenth century through to the Second World War, her survey gives a fascinating insight into the conditions of domestic service and the experience of those who worked within it. She quotes examples from the sources to show exactly how they can be used to trace individuals. Chapters cover the historical background of domestic service; the employers; the social hierarchy within the servant class; and the recruitment and responsibilities of servants. A comprehensive account of the available sources – the census, wills, directories, household accounts, tax and union records, diaries and online sources - provides readers with all the information they need to do their own research. This short, vivid overview will be invaluable to anyone keen to gain a practical understanding of the realities of servants' lives. A comprehensive and invaluable reference guide, useful to beginners and more experienced in genealogy alike, to trace the lives and careers of servants and visualise their everyday working lives from reading household manuals, diaries and autobiographies. This authoritative guide is essential reading if you want to learn a whole lot more about how your servant ancestor found employment, worked, lived and spent their leisure time. This book covers the period from the 18th century through to the Second World War giving a fascinating insight into the conditions of domestic service and the experiences of those who worked within it. It quotes the available resources of the census, wills, directories, household accounts, tax and union records, diaries and online sources enabling readers to find their own servant ancestors. I found Michelle Higgs' book, Tracing Your Servant Ancestors: A Guide for Family Historians, very readable, well organized and nicely illustrated. Higgs chose to define her topic broadly including domestic, farm and institutional servants. I appreciated this as among my own family there are parlour maids and general domestics, gamekeepers and gardeners. Higgs' aim is to provide information both about the conditions of servants' lives and the records useful in documenting those lives, including family life and life during sickness or in old age. In that she succeeds by providing overviews of work roles and historical changes in service tasks, conditions and expectations, quoting often from archival and published records, for instance, from letters, memoirs and manuals like Mrs. Beeton's Book of Household Management. The case studies she presents, and her many examples, from the influence of the bicycle in giving servants more personal freedom to how a footman's height might determine his pay scale, kept me interested. One chapter outlines general sources for those new to family history, like the English and Scottish census, wills and poor law records, and one chapter is on records with specific information on servants, for example, estate, tax, trade union and servants' registry records. I was surprised not to notice mention of any emigration schemes associated with servants, or of researching servants in Royal households. And a note about peerage records might assist those who've heard only that great grandmother cooked for a certain Duke in London. But Higg's many tips are always to the point and, indeed, several of the suggestions here will be valuable for researching servants anywhere in the world. Overall, I found this a well balanced guide and I would certainly have no hesitation in recommending Tracing Your Servant Ancestors to other researchers. The author has already written five social history books and is a freelancing writer specialising in history and heritage, whose most recent book was Tracing Your medical Ancestors. This tome covers a multitude of sources for records including the censuses, tax and union records, diaries and on-line sources. But the most fascinating aspect is how she describes the conditions and experiences of the servants in a world that is within living memory for many of us but was ended forever by the Second World War. This book is well researched and contains many points of interest for those wishing to learn more about servant life in general. …enjoyable and well-written social history, helpfully revealing more about what life would have been like for your own kin ‘below stairs’. Downton Abbey and Upstairs Downstairs show how the lives of ordinary folk ‘below stairs’ are just as interesting as those of the wealthy house owners. The fact that 1.3 million domestic servants appear in the 1911 Census also reveals that it’s much more likely that these are the people we will find in our family trees. Here Michelle Higgs, who has numerous social history books to her name, turns her expertise to the sources available for researching people in service. She divides the book into four sections. The first explored the history of domestic service from the 17th to the 20th century discussing different places of work – from middle-class houses to hotels and schools as well as grand estates. Part two then follows up their daily lives, from working conditions to what they did in their spare time. Part three forms a catalogue of the many different roles, male and female, from stable boy to butler. The final section delves into the most useful sources for research including censuses, wills, memoirs and more. This short, vivid overview will be invaluable to anyone keen to gain a practical understand of the realities of servants’ lives. … is certainly a most useful starting point for anyone setting out on this daunting task. 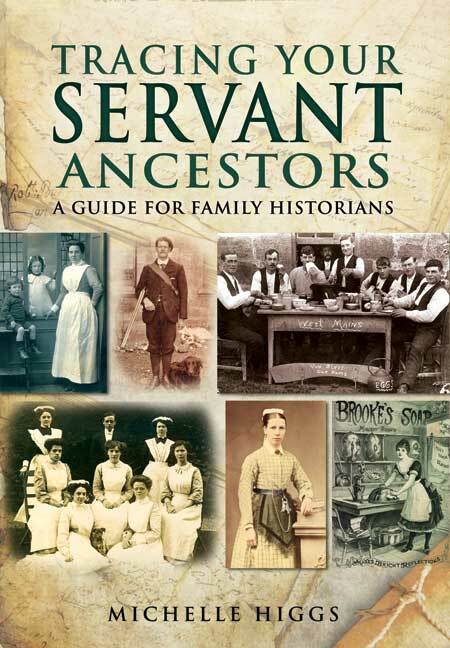 Read this book for an introduction to the history of servants, an overview of the world of servants and their duties, information about how to trace servant ancestors, a comprehensive account of the available sources.